The Ali Trophy semi-final bout in the cruiserweight edition of the World Boxing Super Series between WBO World Champion Aleksandr Usyk (13-0, 11 KOs) and WBC World Champion Mairis Briedis (23-0, 18 KOs) hits the Arena Riga, Latvia on January 27, 2018. “The stand-out atmosphere in the quarter-finals was the noise the fans made in the sold-out Arena Riga,” said Kalle Sauerland, Comosa’s Chief Boxing Officer. The Ukrainian went to Berlin in Germany on September 9 in the tournament opener and produced a spectacular display at the Max-Schmeling-Arena to stop former world champion Marco Huck in the 10th round. Now he travels to another opponent’s backyard to face a current champion. “I do not care where I fight,” said Usyk, the tournament’s number one seed. 32-year-old Briedis excited an ecstatic hometown crowd at a sold-out Arena Riga on September 30 to score a unanimous decision in his quarter-final over the tough Cuban challenger Mike Perez. 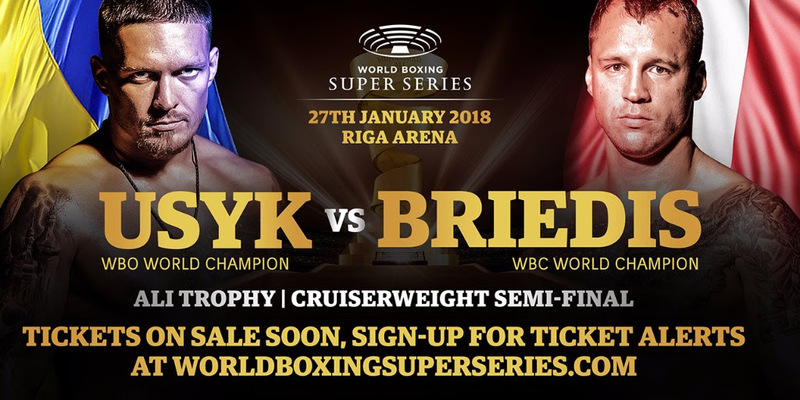 “I had a gut feeling that the World Boxing Super Series might return to Riga because of the incredible crowd at the Arena Riga in the quarter-final bout against Mike Perez,” said Briedis, the tournament’s third seed. Usyk and Briedis will soon come face-to-face at a kickoff press conference in Riga and tickets for the Ali Trophy semi-final between are going on sale next week with the exact time to be announced shortly. Fans are asked due to the huge demand to sign-up for ticket alerts at worldboxingsuperseries.com to avoid disappointment.